The pace of life in Luang Prabang, Laos is so very charming. Charming is the only one-word description I can come up with for this low-slung city with wide streets (unnatural for much of Southeast Asia), French inspired post-colonial architecture, monks clad in sunny saffron robes, and a humming buzz of relaxed tourism. I wrote earlier about the changes three years and more tourism brought upon this sweet, sleepy country set between Vietnam and Thailand, but what cannot change in the intervening years between my visits, is the history. 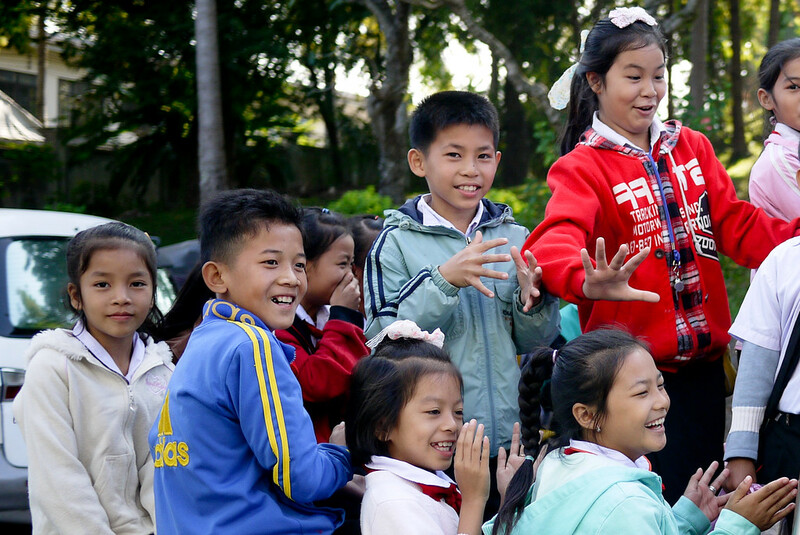 Laos was the first travel destination I took my niece Ana to see once we left our apartment in Chiang Mai, and beyond the elephants, the river, and the Laotians, I really wanted her to experience a relaxed week enjoying the various elements of Luang Prabang. Hours before the night market clogs the main tourist street in Luang Prabang, Vat Ho Pha Bang shines against the ultramarine sky and purple bougainvillea within the pristine National Museum complex. The city retains a rural and small-town feel despite it’s place in history as a royal capital in the 8th century, and an active trading hub on the Silk Road for many succeeding centuries. Now, it’s a UNESCO world heritage city, but no longer the capital of Laos, which I think is a very key reason the city has remained small despite globalism and tourism. The city is a UNESCO World Heritage Site, and on this trip Ana and I spent simple days watching, observing, and talking about history and how it may have shaped the town, what it might have felt like when Laotian kings walked the streets. I find myself slowing down a lot more with Ana in tow, instead of spending the evenings with a beer at the bowling alley (hugely popular with the backpackers in the city back in 2009), we found a coffee shop on the river. The shop’s well-worn cushions and knee-high, woven bamboo tables were cozy and comfortable as we sipped our tart, icy lime drinks. We people watched for a bit while the boats hummed on the river below, then wrote in our journals of the day’s sights, me encouraging Ana to draw pictures, note specific moments and feelings. I realized as we sat there that I too rarely reflect on my travels offline and via a handwritten journal. I documented my round the world trip in a journal, but that ended somewhere along the way. Ana was quick to point out that I was a hypocrite for making her document her personal thoughts and journey when my fingers jetting over the keyboard with a clatter rather than the soft hiss of putting pen to paper. I know that I think best on paper, but I am so caught up in what I still need to do-plan-work on that I rarely step away from the computer without conscious effort. And so, I made more of an effort to unplug, I mostly stopped blogging for a bit and since Ana and I found ourselves in Luang Prabang for several extra days, I found I still loved visiting this pretty little city. We had a beautiful guesthouse with a friendly proprietress who spoke English, so I had Ana read our Laos guidebook and pick interesting activities, then ask for advice from our guesthouse owner. And even three years later, I still love the temples, smiles, and food. The people, monks, and tourists. All these combine into a city with charm, heritage, and personality that I knew I loved, but needed a reminder to stop and enjoy. Tiny stools jut onto the sidewalks in the misty hours of dawn as locals sip a steaming soup adorned with herbs and spices before they took their tuk-tuks and mottos for a full day of work. 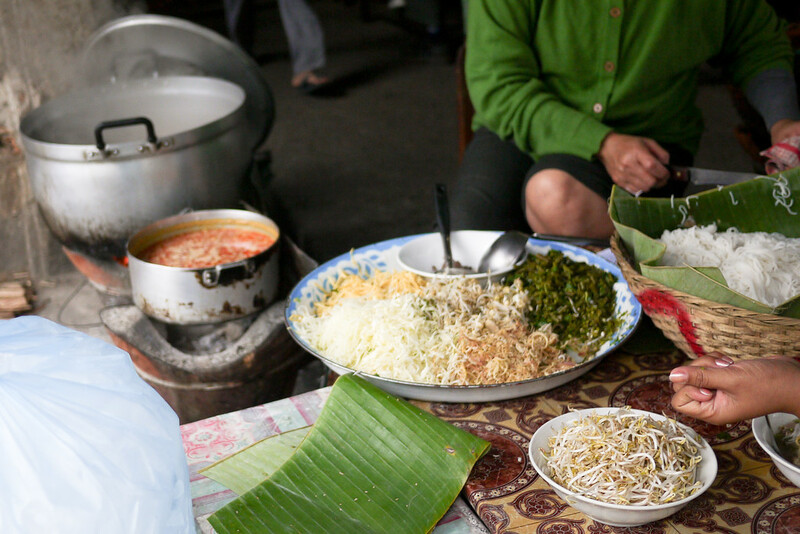 Though western breakfast shops bracketed this tiny soup-stand with croissants and lattes, it was just as easy to hunker down with the locals, point and smile at the soup, and within minutes be happily slurping down fragrant broth and noodles. My breakfast was complete only after purchasing a 5,000 kip (about 60 cent) fruit shake from the corner stalls displaying colorful cups of pre-chopped mixed fruit ready blend into a condensed milk, ice, and fruit concoction that defies logic on its tastiness! 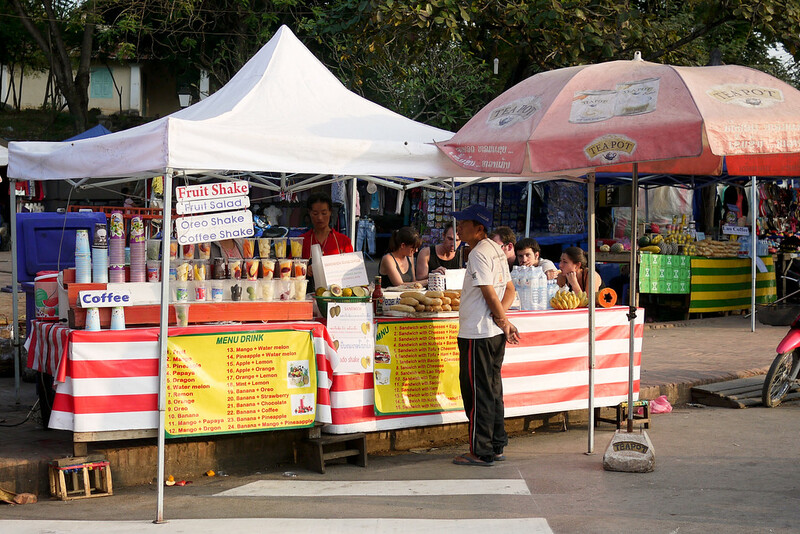 Smoothies are my go-to snack in Southeast Asia, and as we had our shake blended, numerous mottos zipped up to the stand to also grab a blended beverage before zooming on their way! With some poppy traditional music blaring from the truck speakers, these kids were happily clapping, singing, and shouting hello. I suspect this was a parade of sorts, or class trip perhaps, since several truck-beds passed by in the late morning with the cheery children, all of whom were giddy with excitement to wave to us as we paused and watched them gently roll down the road, the driver careful not to jolt the truck too much! With a freedom distinctly uncommon in the United States, this little girl independently toddled down the street on her mother’s high heels, stopping at nearby vendors, grabbing her morning snacks and hugs before heading back to the shop where her mother sold fair-trade crafts and scarves. One of the things I love about Luang Prabang are the family compounds that also act as guesthouses. 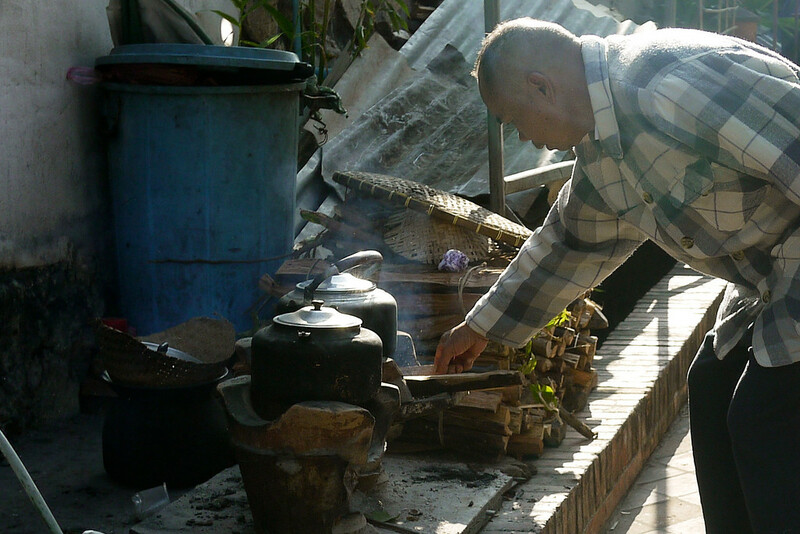 In many cases, each guesthouse is also the home for several generations of Laotians. This grandfather on my street stoked the early morning fires, cooked breakfast and minded his grandchildren while the middle generation took care of us tourists, cleaned the guest rooms, and generally ran the business; every member of the family feeling useful and needed to balance the dynamics. 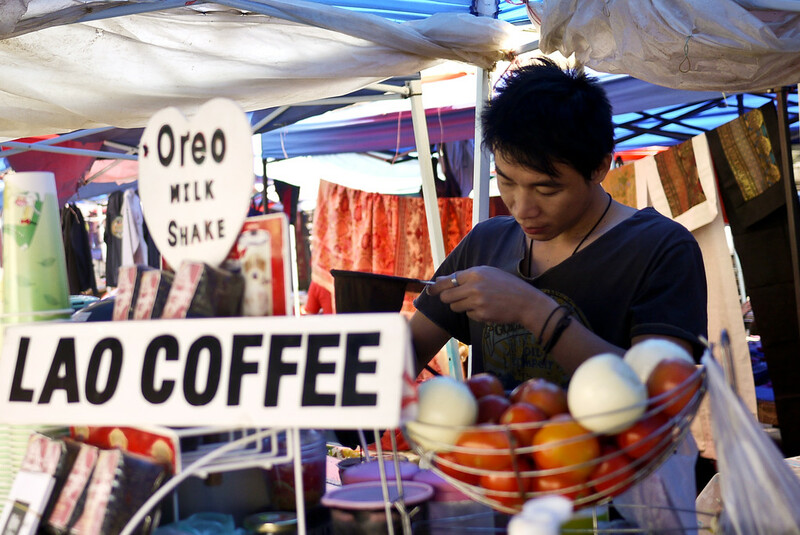 The night market walking street comes alive with long buffets of food. 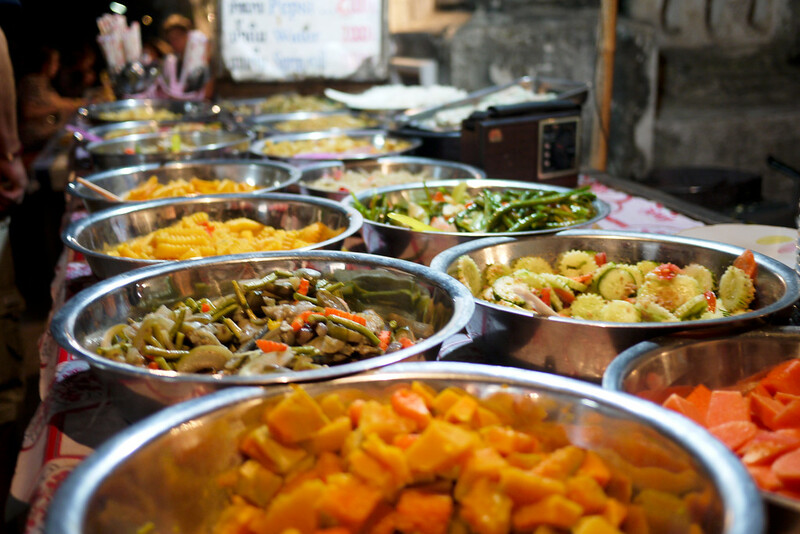 Vegetarian buffets were present even back in 2009, and for just over a dollar US we piled our bowl with a variety of flavorful vegetarian dishes. Nearby skewers of meat appeased the omnivores (including Ana), and buckets of cold drinks, snacks and treats were all sold with the quiet soft-sell and placid smiles from vendors. 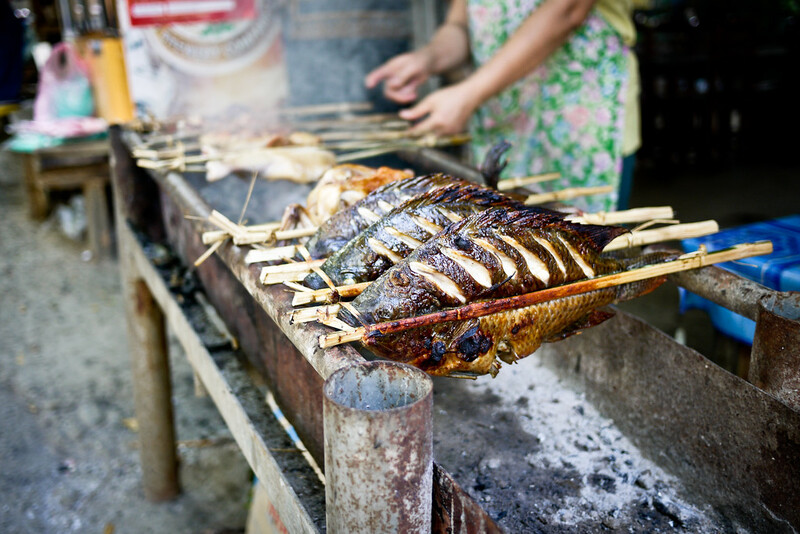 Freshly grilled fish was easy to find, and while not something I eat, it fascinates me to see the fully recognizable fish skewered and prettily presented for eating. I find food in the US is often purposely packaged to disassociate itself from the animal it actually is, while culturally in Asia, they often consume and enjoy nearly every part of the animal! After just three mornings of a habitual coffee to start my day, the vendor would smile and wave as I approached. On the fourth day, he beat me to the punchline and happily parroted out my precise coffee order, remembering my explicit instructions “noooooo sugar,” which pegs me as so un-Asian since they adore adding condensed milk and sugar syrup to just about every single drink they serve. The calls for service from the tuk-tuk drivers pelt out into the day like a woodpecker making his home in a new tree. Every time we passed one of these shared taxis, the driver was quick to list out all the possible tourist activities for the day, and though it could have gotten annoying, I rather like the consistency of their chant, quite unchanged from the one I heard recited several years ago on the very same street corner. 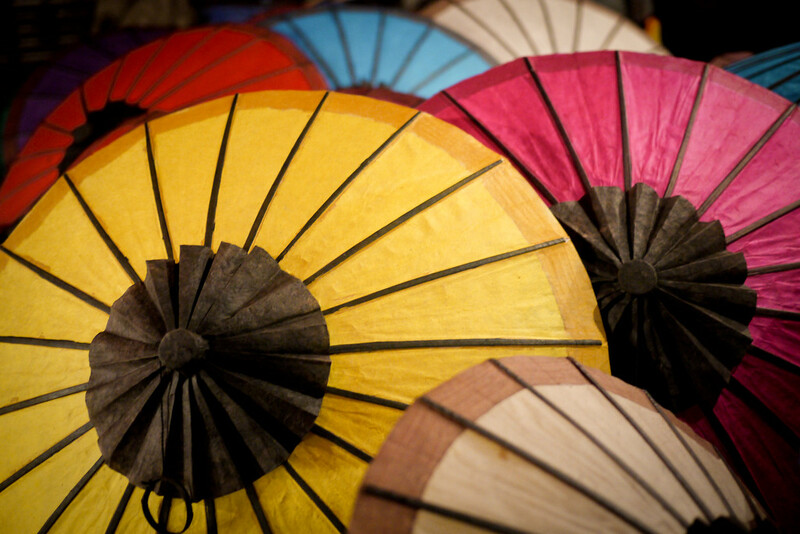 Colorful paper fans glowed from the rattan mats lining sidewalks of Luang Prabang’s night market. The bright pigments do a fantastic job of drawing the tourists closer to the variety of wares. Like bees to a brightly colored flower, my niece and I followed the magnetizing draw of crafts and conversation humming on the city’s crowded street and dug through the kitsch to find quirky coins and beads for Ana to make into bracelets. From Mount Phousi, the highest hill in the center of Luang Prabang, Ana and I watch the sunset over the hills and rivers encircling the world heritage city center. We visited in late November, just as the region’s rainy season finished, and the reward was a landscapes so verdant it could inspire poetry in those more inclined to flowery words than myself. Low-slung streets, shining golden temples, tall palms and quiet river waters make this city an enduring riddle that seems both supremely touristy and yet unchanged throughout the past hundreds of years since construction of the first temple. The city has seen much history, but is so humble. 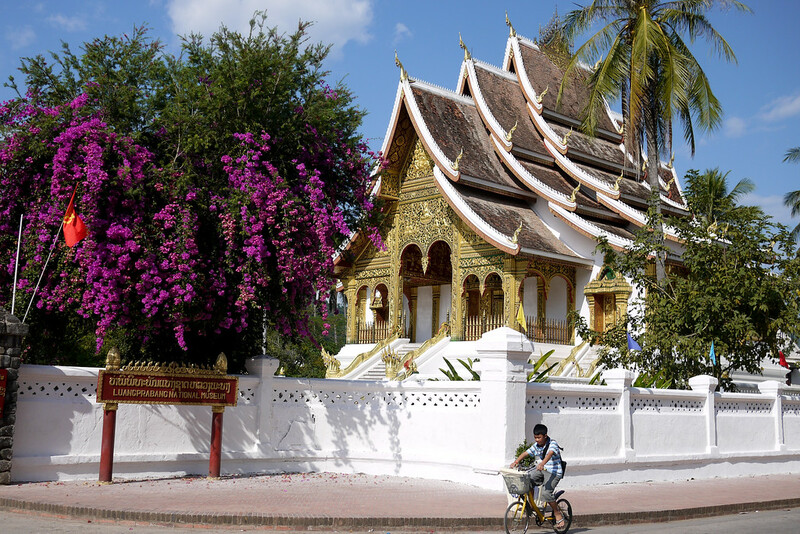 I find myself oddly drawn here, and Ana asked me if I wanted to maybe live in Luang Prabang, to become an occasional expat in the city I waxed poetic about even before we arrived. I surprised her by answering “no.” No, I don’t want to live in Luang Prabang. I love the lazy sunsets enjoyed at the confluence of the Nam Khan and Mekong rivers. I love the ability to spend several days biking around the streets, eating a crusty warm baguette (a remnant of the French influence), and visiting temples and waterfalls. The city is compelling, but no, I don’t actually want to live there, a visit every few years is enough, for now. Luang Prabang is honestly one of my favorite cities in the world. Your photos really capture what makes it feel so special. For me, I think it’s the colors of the city that really stand out. Everywhere you look there’s the green of the trees, the gold of the beautiful temples, and the brightly colored silks, prayer flags, and more. Fantastic pictures! Beautiful photos. We will be in Laos (for the first time ever) in the fall and it truly seems to be a gorgeous country. I’m fascinated by the photo of the fish over the coals – interesting how it’s being held up. Definitely agree with you that in the US the animal products (meat, fish, poultry) you buy in stores so often look nothing like the animal it came from – especially when everything is sold filleted. I’ve recently starting buying and cooking with whole fish – there is more flavor and I believe it’s important to know where your food is coming from and how it looked to begin with (that and it usually hasn’t been frozen, defrosted to be filleted and then re-frozen to be sold in stores as is usually done with fish). Beautiful Photos! 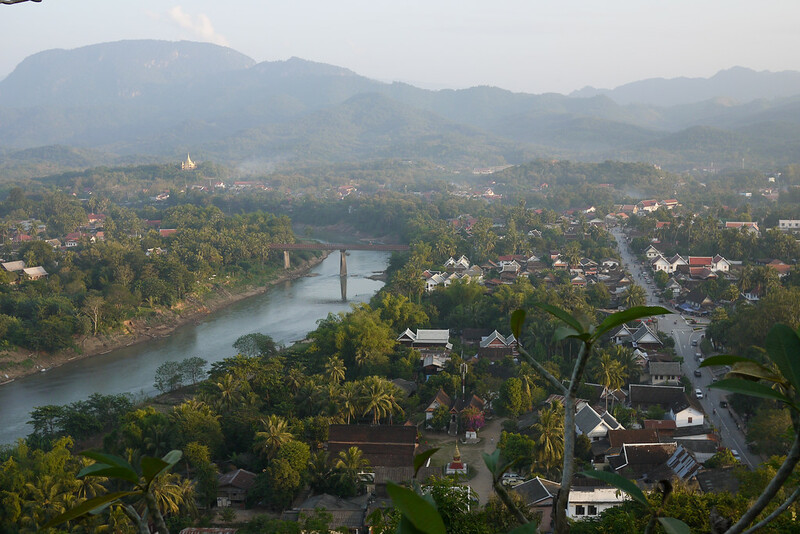 We spent a week in Luang Prabang at New Years and I fell in love with the charm of the city and the people. Thanks for such a great post! I haven’t been to Laos but seems to be a worth visiting and exploring place. Nice pictures! I would have never thought of Laos as ‘charming’ and ‘country.’ However, I love that last photograph. This is a town where people shop and enjoy their lives. This is the type of travel that I love. Admittedly, I don’t know a lot about Laos but I could really enjoy it here with places like Luang Prabang. We are currently in Malaysia and are plotting the rest of our SEA plans, and Laos is penciled in, but you are helping make the case for it being locked in. IT seems a bit like the city we are in now, Melaka actually. Great photos, I would love to go there someday, because I have read a lot of things about Laos. A friend of mine have been there before and said that Laos people are really welcoming. Thank you Shannon, for sharing your stories with us. i’ve heard so many nice things about this place. i’ll just have to live vicariously through your asia posts until i can make it there. love the first photo. Nice article… Have you been to Malaysia or India before? Laos fascinates me. I like that it hasn’t become a tourist haven like Thailand and Phillipines, while retaining all the charms of those places. Something tells me you might set base here Shannon. I know I’d consider it if I were you. plus the fact that it is in close range of all those other SE Asian countries. Damn, I am returning back this June and your blog has enticed me to actually make a trip there. But what can one do if you actually set base there, with a degree in…er film-making!! This is the first time I have read about Luang Prabang and I am really impressed by the beauty of the city; thanks for sharing a new bucket list place for me! 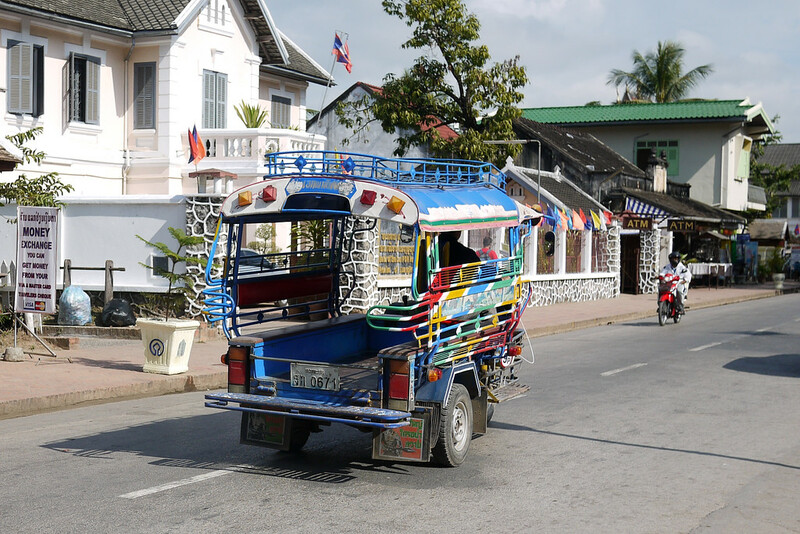 Hooray for tuk tuks! Well, maybe not hooray but they definitely have a spot in my travel memory haha. Great shots! Love the colours, particularly on the fans! Hi Shannon! Just stopping by. Been a short time. I enjoyed catching up on your recent travels. I must have missed the one when you came here to Cleveland, OH…the booming metropolis. LOL. But seriously, I hope you have a great weekend and I promise to stop by more often. The photo of the the colorful three wheeled truck is superb! Hopefully you found a breather when stepping away from the computer for a bit. I really love this. We’ll be there in 2 weeks and I can’t wait to experience the city firsthand. Thanks for getting me excited! Your last shot from Mount Phousi reminds me a lot of a more populated Kwai river shot I have when I went to Bangkok… and now I want to go back. Thanks lol. Seriously though, it’s amazing to see what Laos has to offer! I wasn’t really sure what I would do either when I was there… I mean I know what SOME people do when they go to Bangkok with the ‘shows’ but I’m not really interested in that. Luckily, on our first day we got a really nice, reliable driver who acted as our guide and took us to a bunch of different places. Everywhere we went he knew somebody and it was just an amazing time. Luang Prabang looks amazing! Would you recommend the guest house you stayed at? If so, what’s it called? Thanks! Hmm, maybe that was Ana’s coded way of saying “I want to live in Luang Prabang next year” :) I could certainly see myself spending a bit more time there, as long as I don’t have to catch the bus again from Huay Xai, on the Thai-Laos border. I love the layout of the post, because it really draws your attention to everything in the photos. And you’re definitely right – sometimes we have to disconnect from the computer and just sit with a journal to really absorb a place! I first visited Luang Prabang in 2007 and had a fun and relaxing stay. I wasn’t sure what to expect going back last month after 5 years. I was relieved to find that not too much has changed in that time. I did notice that the night market had become much bigger and was now sprawled over several more blocks and there were more tourists. The fact that it is a world heritage site has probably been a major reason why I didn’t see many more changes to this great city.